It's the 175th anniversary of the birth of John Muir, one of my heroes. Tomorrow is Earth Day, and those two dates are definitely tied, so I'm pausing here to throw my arms around the important man's important legacy. Trees and the Sierra Nevada mountain range play big parts in the Wilfair books. Indoor trees, outdoor trees, and a certain sound that trees make (I tipped my hand a little on a "Stay Awhile" plot point in this early blog post) are in every book. There's a scene I've written a few times in my head involving our Wilfair pals and John Muir. Or the idea of John Muir, rather. Fair's a redwood (that counts as a California icon). I also like her dressing as dancer Isadora Duncan. Or perhaps San Francisco. The whole city, with little buildings and bridges and twinkly lights all over her costume. Monty's Jack London or John Steinbeck. 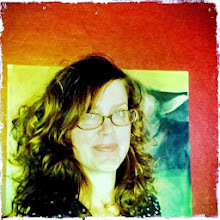 Sutton might be Sarah Winchester (hi, Myranda) or Julia Child, a beloved Californian who knew her way around a cleaver and a bowl of fruit. I'd also love for Sutton to pay tribute to astronaut Sally Ride, another hero of mine. Truly, I can't get the picture of Fair as a tree out of my head. Nor the scene of Sutton helping her body-glue bark to her arms and twigs in her hair. It's all ridiculous, but you now know about my close-knit relationship with the ridiculous. I love California, and I love it as a big, tree-filled, mystery-laden, hope-filled setting for the books. 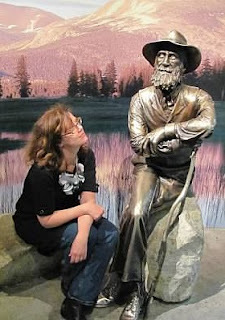 Photo: A John Muir statue (and an ardent admirer named Alysia) in Yosemite. Thank you, Mr. Muir! Trees!!! i think that sounds like a delightful idea. because costume parties are the best anyways, and THEMED costume parties are the ultimate best! also, muir. Themed costume parties, YES! I like costume parties but they have to have focus. Anything. An era, an idea, a style of music, something.